This 06 Nights and 07 Days itinerary you will cover Khajuraho Dance Festival along with visiting Bandhavgarh National Park and Kanha National Park is an idyllic tour for enjoying classical Indian dance, beautiful ancient temples and wildlife at the same time. The major attractions of the trip are exploring Khajuraho Temple, attending classical dance performance by famous artists at the time of Khajuraho Dance Festival, evening safari at Bandhavgarh and early morning safari at Kanha. Today arrival at Khajuraho. On reaching Khajuraho airport, meet tour representative who will there for your welcome and later on transfer you to your pre-booked hotel. Check-in to the hotel and get ready for the exciting sightseeing tour of Khajuraho. We will start with the visit to the astonishing temple of Chandela Dynasty which is indeed the pride of the place. Khajuraho has been recognized as a World Heritage Site by UNESCO for housing many ancient temples and historical places of public interest. In the rest of our day, some other interesting temples that we are adding on our list include Lakshmi Temple, Vaman Temple, Lakshmana Temple and Adinath Temple. Thereafter, we will return back to the hotel for an overnight stay. In the morning after breakfast, we will leave the hotel to witness the beauty of the cultural town of Khajuraho. We will also going to attend , the Khajuraho Dance Festival, which is undoubtedly one of the major attractions of the place. Arranged at the Western Group of Khajuraho temples, this festival is a best mean to witness the traditional Indian classical dance performed by some professional artists. Some of the exclusive dance forms that you can see at the festival are Manipuri, Bharathanatyam, Kathakali, Odissi, Kuchipudi and Kathak. After being a part of the exciting Khajuraho dance festival we will return back to the hotel for an overnight stay. Today after having delicious breakfast in the morning, we will leave by road for a visit to the Bandhavgarh National Park. 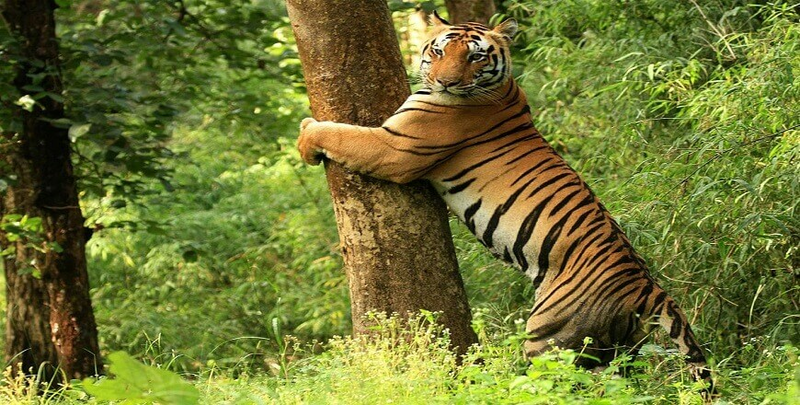 This national park is one of the famous national parks of India and is known for housing a large number of tigers. It was initially known as the hunting grounds of the Maharaja of Rewa. On reaching, check in at your already booked jungle lodge for an exciting experience that is yet to come. After the lavish lunch at the lodge, take a walk in the garden of the lodge and enjoy the modern amenities that are been offered within the lodge premises. In the evening, we will leave for jungle safari in the park which is already scheduled by our tour guide. While enjoying your evening safari, you can see varied animal species such as Sambhar deer, Panther, Wild Boar, Spotted Deer, Gaur, Nilgai (Blue bull), etc. In addition, you can also spot around 280 species of birds that will leave you with an unforgettable bird watching experience. Later return back to the lodge for a relaxing overnight stay. After having healthy breakfast at the lodge in the morning, we will drive to Kanha National Park which is another retreat for wildlife lovers. The park has been an inspiration for the renowned novelist Rudyard Kipling to come up with an amazing novel named 'the Jungle Book' that has got recognition worldwide. On reaching the Kanha National Park, check-in at your pre-booked jungle resort. Enjoy lunch in the restaurant on the lodge and thereafter take pleasure of the modern amenities of the lodge. After evening tea, we will leave for a jungle safari in the park. The evening safari in the park is indeed of the best medium for exploring the true wilderness of the park. You can spot the famous Royal Bengal Tiger and other species of animals like the sloth bear, Barasingha, leopards, Indian wild dog and around 300 avifauna species. In addition, you will also get a chance to witness the beautiful sunset view at the Bamni Dadar point that will add on to the overall charm of your wildlife tour. Later return back to your lodge for a comfortable overnight stay. Today, we will wake up early in the morning and proceed for the early morning safari in the Kanha national park. Remember that both evening and morning safari have the charm of their own. During your morning safari in the park you can see wild animals in their natural habitat and have a thrilling experience. Later, we will return back to our hotel and leave for Jabalpur railway station or Airport. Trip Ends here with lots of Good Memories.